Special tools were developed for harvesting specific types of plants. Tools for harvesting and preparing grain will be examined below. The sickle and scythe (seen at right) are tools that are used to cut and harvest wheat in the past.Though unusual in our country, some cultures still use these hand tools today to harvest wheat. Mechanical reapers eventually replaced the hand tools. Threshing is the separating of the grain or seeds from the plant material. A person used a flail to beat the grain out of the grain head. Early Threshing machines were used when the internal combustion engine became available. After World War I the cutting and threshing process was combined into one machine called the combine. It could cut wheat, thresh out the grain, and store it in a bin on the machine. The process of separating threshed grain from the chaff is called winnowing. 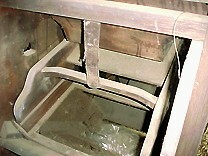 After threshing, the grain and shaft left on the floor were tossed in the air in the wind using a winnowing basket (shallow basket as seen at right). The basket was lifted up and the mixture was tossed in the air. The wind blew away the lighter shaft and the heavier grain fell back into the basket. Winnowing usually took place in a barn between two open doors with a continual air flow. In the beginning of the 1800's fanning mills or grain fans were used to winnow grain from some farms. Due to expense of the equipment, the hand method of winnowing was used well into the 1900's. Winnowed grain was stored for animal feed or taken in sacks to the mill to be ground into flour. Fanning mill on display outside the Mercer Museum in Doylestown, PA. A view from the top of the inside of the same fanning mill. 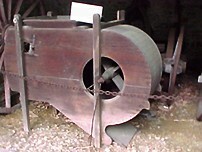 The fanning mill is also known as a grain fan or winnower. Inside this machine were several wooden blades connected to a shaft. A handle outside the box was used to turn the blades and create a blast of air in the machine. The grain and shaft was fed into the funnel-shaped hopper at the top of the machine.The lighter shaft, dust and straw was blown out of the open end of the box; the heavier grain fell into a container placed at the bottom of the machine.